by Luca Feletti and Renato Romero. 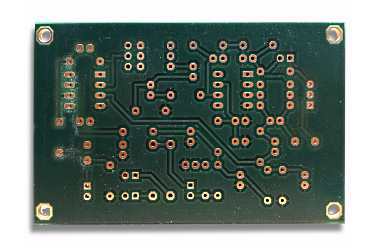 PCB layout by Jochen Richert. If someone asks you "How can best be described a good VLF loop?" Probably your’d answer: "It must be: small, portable, sensitive, cheap and easy to build. And if, in addition, ìt also serves to signals measuring... it would be IDEAL". This project is the EASYLOOP receiver evolution, made in 2002 and built again and again by many VLF listeners: despite its simplicity, it has given great satisfaction, receiving whistlers, chorus and others natural radio signals. 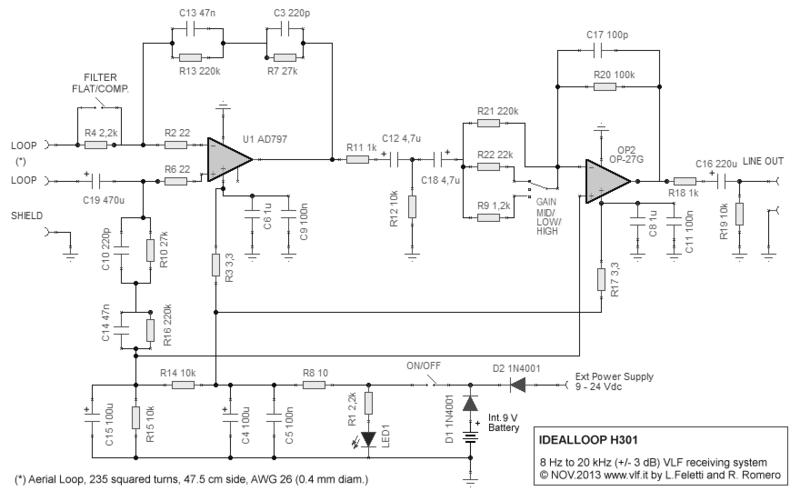 If you think it's time to have something more read this article: the IDEALLOOP H301 is a compact loop to receive VLF. It is small and portable but with great performances: up to 15 dB more sensitive than Easyloop and an incredible 8 Hz to 20 kHz bandwidth flatness, with only 50 x 50 cm space. It's able to receive with great sensitivity all classic natural origine radio signals: whistler, chorus, tweeks, and even in the background Schumann resonances. In addition of course to all the man-made signals such as military, RTTY radio navigation signals and SID effect on it. We started with some considerations: a wide-band loop antenna with good performances is given by a proper loop/preamplifier matching, and an adequate turns/size dimensioning to overcome the loop intrinsic thermal noise and the operational amplifier input noise. Size, copper weight, number of turns and wire section are the loop elements that determine the final result. 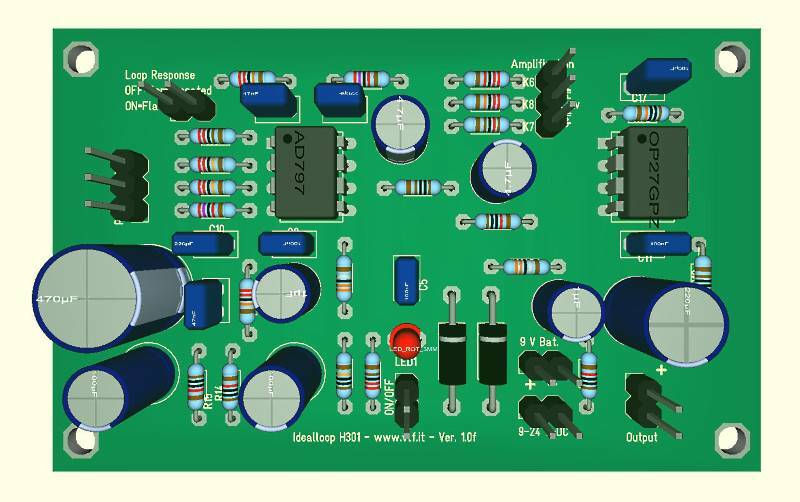 But it is not all: loop receiver and preamplifier circuit are to be considered all in one: the preamplifier is not a generic preamplifier, it is THE preamp for that loop. There are many parameters contributing to a proper functioning of the system, and they are closely connected one with another. For example: by increasing number of turns we increase the capturing area then we get more signal, but at the same time we decrease the self resonating frequency and we increase as well the system impedance. If the impedance grows, noise increases too induced by operational amplifier current noise. In few words, by maintaining the same operational amplifier: sometimes more turns can cause less sensitivity. It does seem impossible but it's true! Loop sizing, to be effective, must be the best compromise between these various components. The loop impedance is in fact another very important parameter. In addition to thermal noise generated by the resistance of copper wire, we must also deal with the noise input of operational amplifiers: it is strongly influenced by the source impedance, and the value of S/N can vary by tens of dB the impedance. The impedance should be a manageable values for the whole frequency range in which we want to run our loop. After all said and done we decided that a good portability and a good sensitivity are achieved with 1/2 kg of copper on an area of 0.25 square meters. Have to be considered valid in this regard the remarks made in the design of Minimal Loop (http://www.vlf.it/minimal/minimal.htm): loop sensitivity is determined by the weight of the copper used for occupied area. If we had an ideal preamplifier (free input noise) the reasoning would be over here, but it is not yet: loop impedance (and therefore the turn number) influences the noise of preamplifier input, then the noise figure, and then the final sensitivity of the device itself. Size and weight of copper loop must be decided according to wire diameter available, which is more appropriate: many turns of fine wire or few turns of a thicker wire. Few turns mean lower voltage received, low impedance, but low resistance, than low thermal noise and high self resonance frequency. Many turns mean: more voltage across the loop, but higher resistance (then higher thermal noise), higher impedance, lower self resonance. Our choice was determinate therefore by system impedance: loop signal will be amplified and all the best amplifier devices operate with low noise performance with impedances of medium value. The loop was constructed duplicate, to create a RDF system: one will be placed in NS direction and the other one orthogonal to it, in EW direction. From the comparison of inductance values it is clear that it is virtually impossible to build two identical loops, also using the same turn number and two similar frames. We shall see later that this is not quite a problem. 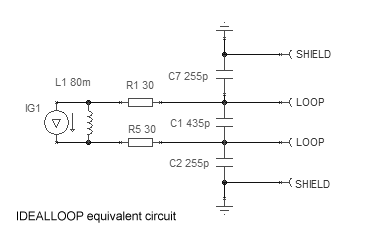 With the same instruments, measured capacity between loop conductor and aluminium tape shielding was 510 pF (here in the circuit splitted in two 255 pF capacitors). We can so imagine the equivalent circuit as shown beside, where R1 and R5 are the copper wire resistance, L1 is the loop inductance, C1 is the parasitic distributed capacitance between the loop turns, and C2 and C7 are the capacitance between loop and shielding. Knowing the values of our loop we are now able todetermine the impedance at various frequencies. This data helps us to choose the operational amplifier according to the input noise, voltage and current. There are many ways to calculate the loop impedance at various frequencies. We can use the formulas, since we know the values of the equivalent circuit. Or we can use a simulator to determine this value. 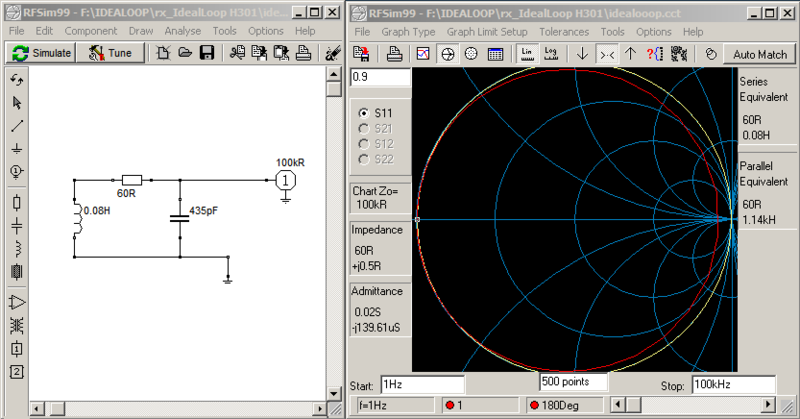 A very simple and free software to use is "RFsim99". It analyzes the circuitry in very similar way to a network analyzer, providing the S-parameters and the impedance values. Here is our loop simulated with RFsim99 and the graph of its impedance. Accurate impedance values are obtained by moving the horizontal cursor in the panel to the desired frequency. Here in the following table there are impedance values obtained with RFSim99 and the value of Z module obtained from the quadratic sum of the two values. Let’s choose the operational amplifier, selecting low-noise models and see how they behave with our loop. These value applied to the voltage/field loop formula (reported above), and loop impedance, will give us the loop sensitivity at each frequency. 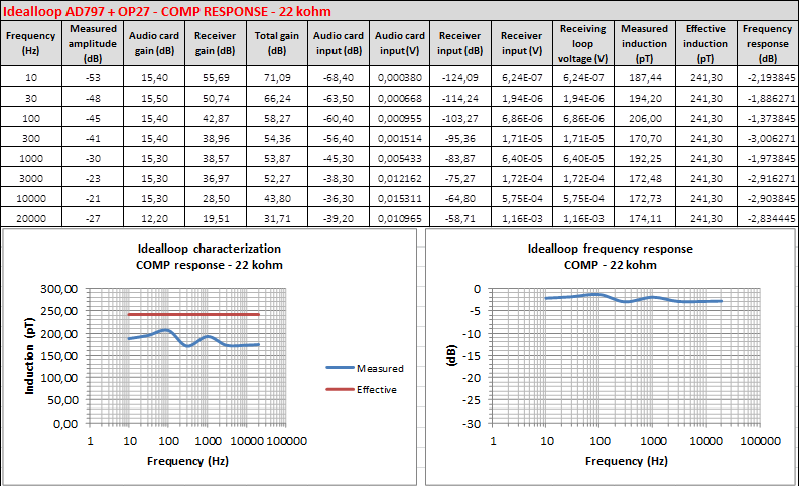 Here the results with the most commune low noise operational amplifier: OP27, AD743 and AD797. 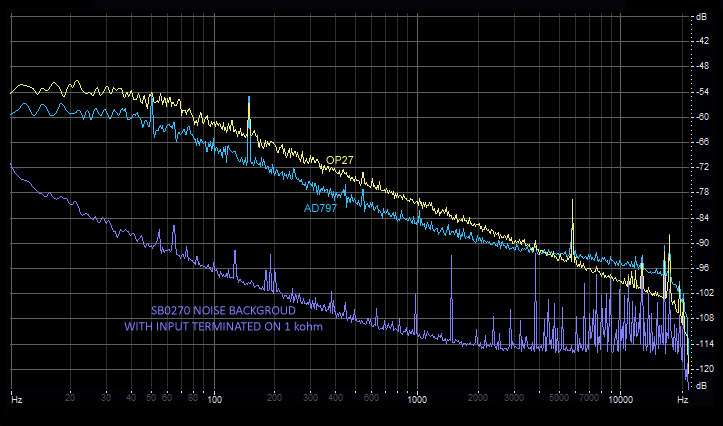 Better result comes with AD797: at 1 kHz it allows a sensitive increasing of 15 dB, if compared to the EasyLoop. We therefore choose to use this op amp to realize our IdealLoop preamplifier: with it our loop will be able to receive very weak signals! However, looking at the green curve, we can see an anomaly from 4 to 20 kHz, where the noise rises suddenly, with worse results if compared to OP27. It is caused by current noise, which AD797 is higher than in the other considered Opamp. When the loop self resonates its impedance becomes very high and current noise of the operational amplifier generates an high voltage noise. 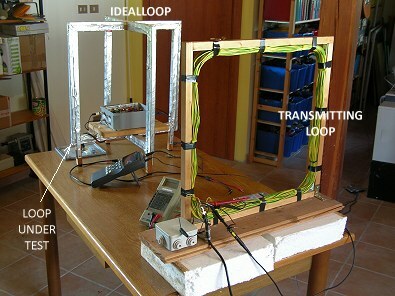 We have also assembled, for the following verification test, a "dummy loop". It was built to simulate the electrical specifications of the loop (inductance, resistance and parasitic capacitance) but screened to magnetic signals. Just like our aerial loop: 80 mH, 60 Ohm and a self resonance frequency of 24 kHz. In practice, a deaf loop, that does not receive. It will be used by us to check the input noise floor of the preamplifier. Attention: these small "olla type" coils perform a very high inductance because inside them the magnetic flux has a closed circuit, as in a transformer (the cover is made by ferrite too). For the same reason, they can not be used to receive signals, singly or in array. But this is just what we need. Our dummy loop is made by a single 80 mH inductance (58 Ohm resistance itself) and a 330 pF capacitor in parallel (the green one in the last picture). 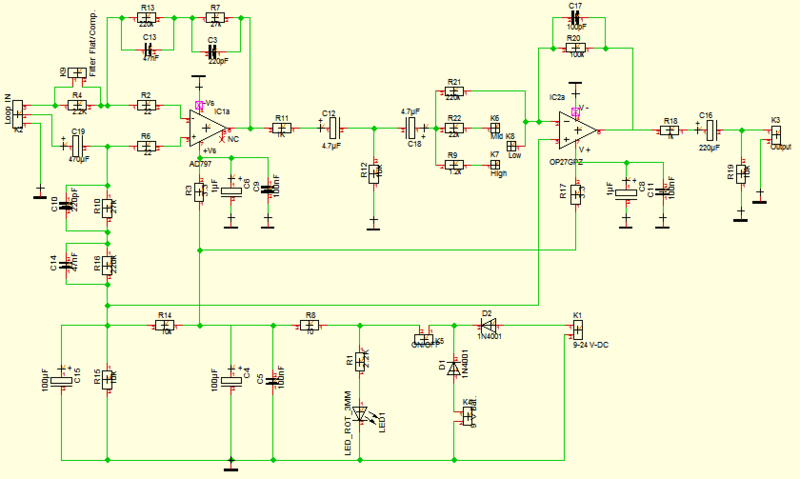 Here is the preamplifier circuit. The chosen circuit configuration is what is called "balanced differential". It provides many advantages for our type of loop, first of all creates a high common mode rejection of signals. Magnetic signals effectively picked up from the loop are amplified, while those ones introduced improperly, for example by capacity way, are rejected. In short terms: the antenna is very sensitive to magnetic field, but almost totally deaf to electric field and disturbances coming to it through the power supply (if it is fed directly) or by cable connects to the PC. 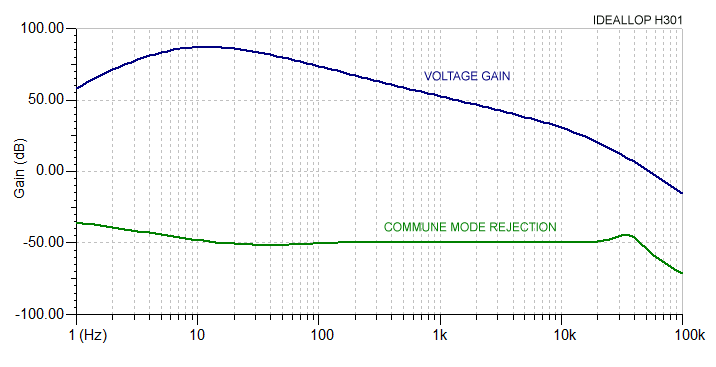 In the graph we see how received signals are amplified (in voltage) by the loop (blue trace) and how those captured in common mode (green trace) are rejected: voltage ratio between received signal and rejected signal, remains greater than 80 dB from 1 Hz to 10 kHz. There are two available frequency responses: FLAT and COMPENSATED. The insertion of the filter "COMPENSATED" induces a frequency response that compensates gain in function of expected signals level, according to indications of Maxwell/Stone graphs in the famous paper of 1963 (http://www.vlf.it/naturalnoisefloor/naturalnoisefloor.htm). From 1 Hz to 10 kHz the dynamic signals range are usually greater than 30 dB, while with filter inserted, the entire range of the signals is contained in 10 dB. 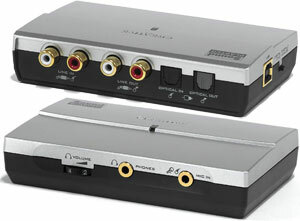 It allows a better utilize the dynamics of the sound card and obtains a spectrogram with a better visual quality. The filter insertion is also useful in case of hum noise: signals at industrial frequency (50/60 Hz) and strongest harmonics are 30 dB attenuated. The compensated filter affects directly the first stage gain: unwanted signals such as hum noise are therefore reduced before being amplified. 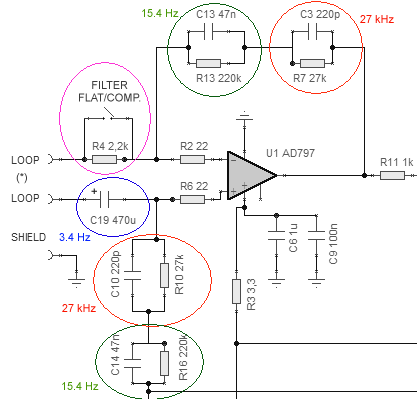 The result is that with the filter inserted the circuit is not saturated even in presence of high hum noise values, such as the interior of a house. This causes a decrease in sensitivity at low frequencies, but it allows to use the receiver even in severe environments. 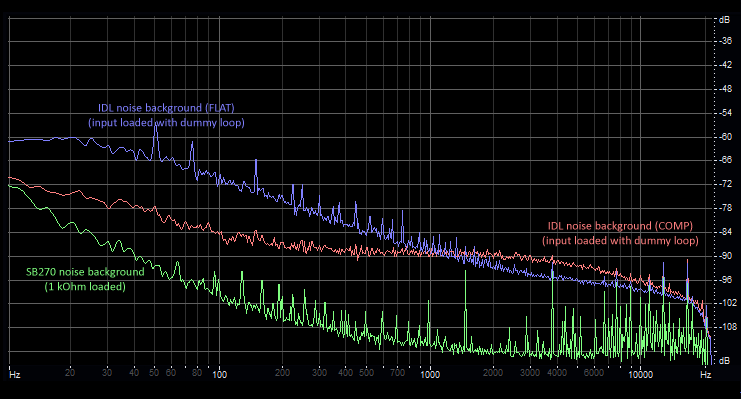 We have a flatness frequency answer from 10 Hz to 20 kHz in +/- 3 dB. This means we can use this loop also as a measurement loop: knowing the antenna factor we are able to calculate the magnetic filed in pT measuring the signal output level in mV simply with a portable multimeter, but we will see this later on. The "secret" of this circuit is all is contained in the input stage: it is modeled as a function of the loop parameters. Let's see how. Reaction network is divided into two symmetrical parts, electrically above and below the loop, allowing it to float. Every part contains a RC cell with a cutoff frequency of 27 kHz and a gain of about 60 dB at low frequencies (red circles), and RC cell with a gain of 77 dB up to 15.4 Hz (green circles). This second part is used to equalize/compensate the cutoff frequency of the natural loop, that, without this network due to its intrinsic resistance, would be of 120 Hz. 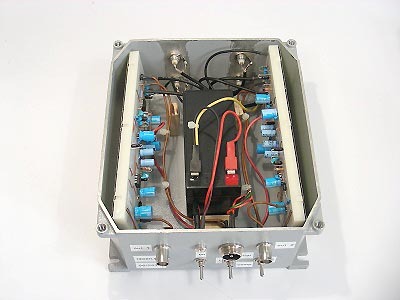 The network extends the frequency response down to few Hz: it only operates up to 15 Hz, after which the capacitor shorts out and it becomes transparent. The capacitor C19 does not enter into resonance with the loop: it simply reduces the frequency response under 4 Hz, avoiding manually moving loop goes it into saturation, due to the Earth's magnetic field. Finally R4, placed in series with the loop, worsens the Q system, lowering the sensitivity at low frequencies and obtaining the COMPENSATED curve response. R2 and R6 do not contribute to frequency response: they only act to protect operational inputs, incase of strong current transition, when a local storm occurs. 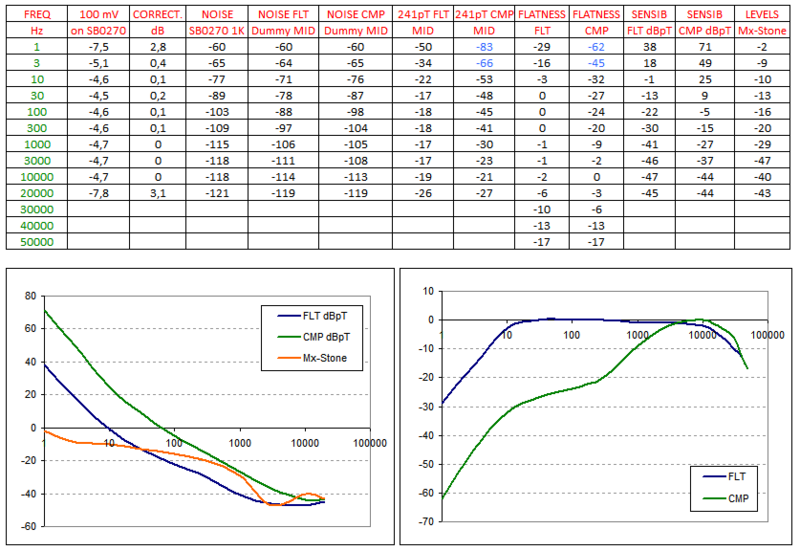 Gains have been calculated so that the first stage output noise is likely to prevail over input noise of second stage. This condition provides the best noise figure available. At the time the overall gain was set so that total noise output from the second stage, exceeding the sound input noise. No output signal from one stage must be limited by one noise input to the next: this is a good rule to keep in mind when designing circuits, always. receiving in prevalence network noise, as obvious. In this chapter we describe the mechanical construction of the instrument. For convenience, we shall make the description following the path of the signal we are interested and we shall do using the block diagram of Fig. 6.1. The first part encountered by the signal is the loop system. We have provided a loop for each axis we are interested in. Since we are interested in possible applications of RDF (radio direction finding) we have made two orthogonal loop; obviously the system works with a single loop also, if our interest is only in one of the three spatial components of the magnetic field. The loop structure is constructed with two square wood support, mounted orthogonally one to the other. 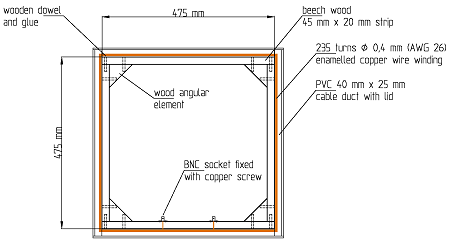 Each side of the square is formed by a strip of beech wood having a cross section of 45 mm x 20 mm and a length of 47,5 cm. In the lower side of each square support we have provided two holes for threading the ends of the winding and two little wooden support legs. All the wood parts are assembled without metallic junction elements, but using only wooden dowels and glue. Over each side a PVC cable duct (provided with a lid), having dimension of 40 mm x 25 mm, is fixed using acrylic adhesive. 235 turns of 0,4 mm diameter (AWG 26) enamelled copper wire are located within the duct with their ends threading trough the said holes. The Fig. 6.2 and 6.3 show what described. When we have finished the winding, we have mounted the lid on the duct and provided to shield the entire structure of the orthogonal loop with an aluminium adhesive tape. This shield is useful against the effects of the electric field (we want to receive the magnetic field) and we have paid attention to discontinue it in four point to avoid the formation of a close loop in the shield in which a current, due to the variation of magnetic induction, would flow desensitizing the entire receiving system. and we have connected the BNC connector bodies to the shield using copper screws. Note: if in the loop they were present iron parts (screws or angular brackets, for example), the system would work equally, but it would be less accurate in RDF applications. After the construction of the loop, we tested their electrical characteristics. Using a RCL bridge, we have measured, for various frequency, the resistive and reactive components of the loop impedance, obtaining a good compliance with the design specifications (see chapter 3). With the dead bug mounting it's possible to realize circuits whose behaviour reflects quite closely that of the realizations on printed circuit, especially with regard to the parasitic capacitances. On the other hand, however, it's quite difficult to make changes to the circuit during test or trial activity. With matrix board mounting we can create circuits arranged rationally and accurately, but, for example, we don't have the presence of an efficient ground plane. Also in this case, it's not easy to make changes to the circuit, when necessary. The breadboard mounting allows the realization of circuits well arranged, but we must take into account the presence of parasitic capacitance due to the mounting board. On the other hand, it's very easy to change a components in the circuit or modify the wiring. Based on these considerations, we chose to develop a prototype using the breadboard mounting, according to the scheme introduced in chapter 5). The Fig. 6.6 shows our realization. We have used two breadbord, one for each measurement axis we are interested in. and the BNC connectors for receiving loops. We chose an aluminium box to ensure the shielding of the circuit against the effects of electric field. The case is electrically connected with the aluminium shield tape that we have provided around the supports of the loop. The characterization of our device has been performed in laboratory, but to do this we had to turn almost all electrical devices off, because the field they generate saturated the loop under test. We have therefore used a battery powered oscilloscope, a laptop running on batteries it also, and a function generator, supplied by network but positioned 8 meters away from the loop. Even the energy saving light bulbs had to turn off. 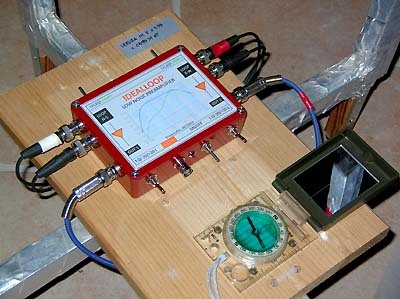 To perform the characterization we used a transmitter loop: it is made from 40 turns of square shape of side 45 cm. In series with the loop is placed 1000 ohms resistance (measured 998 ohm). The resistance performs two functions: first it works as a shunt, we read with oscilloscope the voltage on it, and so we know the current flowing in the loop. By the current flowing in the loop we can calculate the generated field. 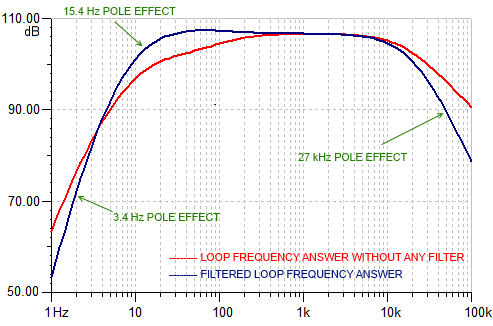 The second function is to worsen the loop Q factor: in this way the current is maintained constant in all audio frequency range, from 1 Hz to 20 kHz in +/- 3 dB (connecting the function generator directly to the loop that does not happen, because of inductive reactance at high frequencies). 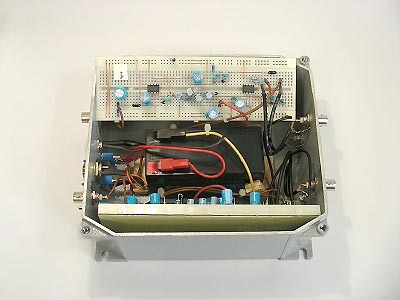 Transmitter loop and receiver loops (here in orthogonal version) were placed as shown in figure, 85 cm away from one another (picture left, below), and away from the function generator and as far as possible from the other laboratory instruments. The loop under test was oriented to have the lowest possible hum noise. Obviously the loop under test and the transmitter loop must be positioned on the same axis, and perfectly parallel. The table is made of wood, and there are not large ferrous metal objects nearby, that may distort the field. We have used to receive the test signal a Creative SB0270 soundcard, chosen because it performs extended linearity down to 1 Hz without any hardware modify, using LINE input. It is no longer produced by Creative but it is easy to find on ebay for a few dozen €uro. Windows mixer audio on PC was set to maximum volume and IdealLoop circuit gain set to MID value. The loop transmitter has been driven with a standard laboratory function generator, by adjusting the amplitude to obtain 100 mV voltage drop on 1000 ohm R shunt: that means 0.1 mA flowing in the loop. With this current, using Biot Savart formula (or Eric Dennison calculator http://www.netdenizen.com/emagnet/offaxis/iloopcalculator.htm) we can calculate a generated field of 241.3 pT 85 cm away, where the receiving loop is placed. Formulas are for loops of circular form, so we considered our square loop as a loop round of equal area. To elaborate the measures, reading the files, has been set an Hanning type window and a FFT of 65536 points. It provides a equivalent noise bandwidth of 1.00937 Hz for bin, so that we can consider the noise values ​​read as valid: they are usually expressed in 1 Hz resolution bandwidth. The COMP Filter reduces the distance from background noise of the sound card: this means that with gain set on MID or LOW at low frequencies the sensitivity of the system is reduced. The thing is rather guessed, but here we also measured it. The two sensitivity curves indicate that where it is possible the FLAT position ensures maximum sensitivity, always refer to the values ​​indicated by Maxwell and Stone in their famous paper in dBpT in 1 Hz RBW. Also the frequency responses of the system are coherent with those we had previously calculated: we have done a good job! Now we have a small and portable system, able to receive very weak signals, and with an amazingly frequency response from 8 Hz to 20 kHz in +/- 3 dB flatness. We can obtain similar results by reasoning in another way also; in particular we can consider the signal path and the amplification of the various stages encountered. So, examining the recorded spectrograms, we can read the measured values at the various frequencies. Then, using a circuital simulation software, we can determine the receiver amplification and, considering the audio card also, the total amplification of the system. Using these amplification values, we can determine the signal levels at the audio card and, then, at the receiver input. The level at the receiver input is equal to the voltage induced in receiving loop by the variable magnetic field. From this voltage we can obtain the relative induction value and this is the measured induction. The tables below show the amplification encountered by signal and the diagrams indicate the effective induction value (generated during the test) and the measured value, showing, in this way, the frequency response and flatness of the system. Loop dimensions are not critical: it can be one centimeters larger or smaller without significantly changing the final result. Even the turns number must not necessarily be respected exactly: 5 turns more or less does not make a difference. 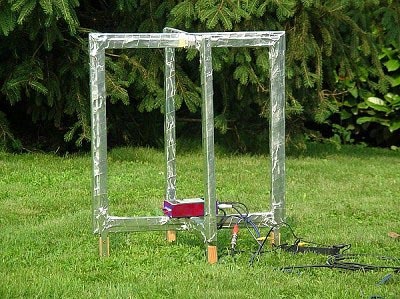 The presence of the screen, made of aluminium tape, helps to reject the electric field, even if it is already in part refused by the adopted configuration that performs a high CMMR. It is therefore not essential to the operation, but it improves. a circuit a compass was glued, to be able to accurately orient the loop and make the most of the function RDF. Also the choice of the input operational amplifier is not decisive hundred percent: the preamplifier also works with a different operational but can change greatly the performance in terms of input noise, and then consequently to input sensitivity. Here's an example of the dummy loop connected to the preamplifier circuit, with gain set to HIGH. Replacing the first stage, OP027 and AD797 in the two examples, the noise input changes and with it also the system sensitivity. 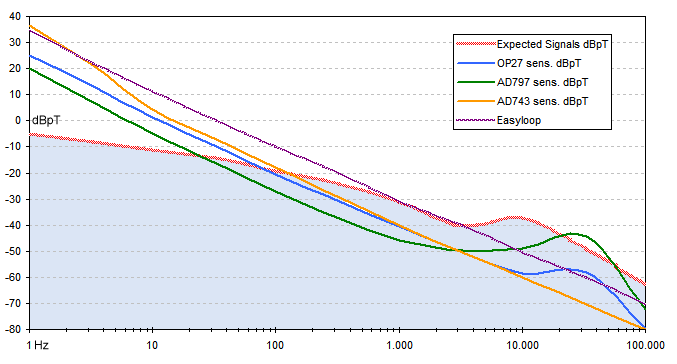 As simulated in Chapter 3 we can see here that AD797 performs better than OP27 up to 4 kHz. At frequencies above the OP27 is less noisy. Since, however, the most critical part as sensitivity is always the lower part in frequency, we made a good choice with the AD797. The noise of the sound card input is much below the noise level of the amplifier: at 10 Hz there are still 12 dB between the two levels. It means that also the gain was properly sized: even jumping the amplifier from HIGH to MID gain, conditions are optimal to not miss any signal received from the loop. This means that none of the mentioned parameter is extremely critical, but the respect of all it helps to have an excellent final result.In the first draft version of the project, the loop preamplifier was calculated to give a bandwidth with a flatness within +/- 3 dB, starting from 1 Hz. The idea of having a loop totally flat from 1 Hz was intriguing. But field trials have suggested to amend specifications: the loop was perfectly flat but the intrinsic noise of the device under 10 Hz was very high. Furthermore the high sensitivity at 1 Hz made him affected by microphone effect: was enough a breath of weak wind, or someone who was walking nearby, to saturating the input, due to the Earth's magnetic field. For this reason, the input circuit has been adapted to the current form, by starting the band flatness from 8 and not from 1 Hz. The extreme bandwidth flatness, when it is used in FLAT, allows us to use this loop also as a low frequency magnetic filed meter. This measurement can be performed by connecting the loop output to a digital multimeter or a portable oscilloscope and measuring the signal level. Once you know the level, knowing the ANTENNA FACTOR too, we can calculate the field. Let's see how to obtain the antenna factor. We have take again the transmitter loop, made from 40 turns of square shape of side 45 cm. The ideal loop was placed 2 m away from it, with transmitting and receiving loop on the same axes (face to face) like in chapter 7, characterization. 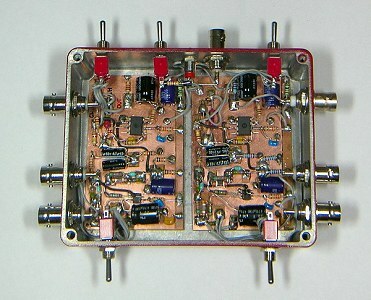 Ideal loop was set with filter FLAT and gain MID, and a portable oscilloscope was connected to its line output. A function generator was connected to the transmitting loop, a 49 ohm resistance placed in series, and a 50 Hz sine wave was injected in it (loop + resistance). Then we have increased the input signal level, until the receiving loop output, reading with the oscilloscope, was of 1.000 Vrms. How we can use this value? It is simple. If in a field session we connect a digital multimeter to the Ideal Loop line output, set with MID gain and FLAT filter. ...or if you prefer 1.169 nT. The inside of my workshop is not a good place to do VLF reception, but I already knew that. 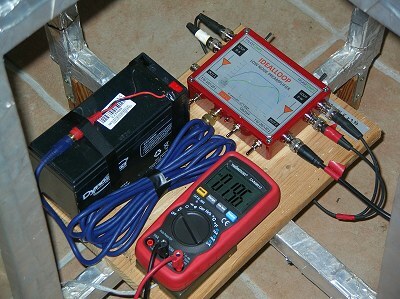 Now our loop is no longer just a loop receiver, but it has also become a measuring instrument: a field strength meter. 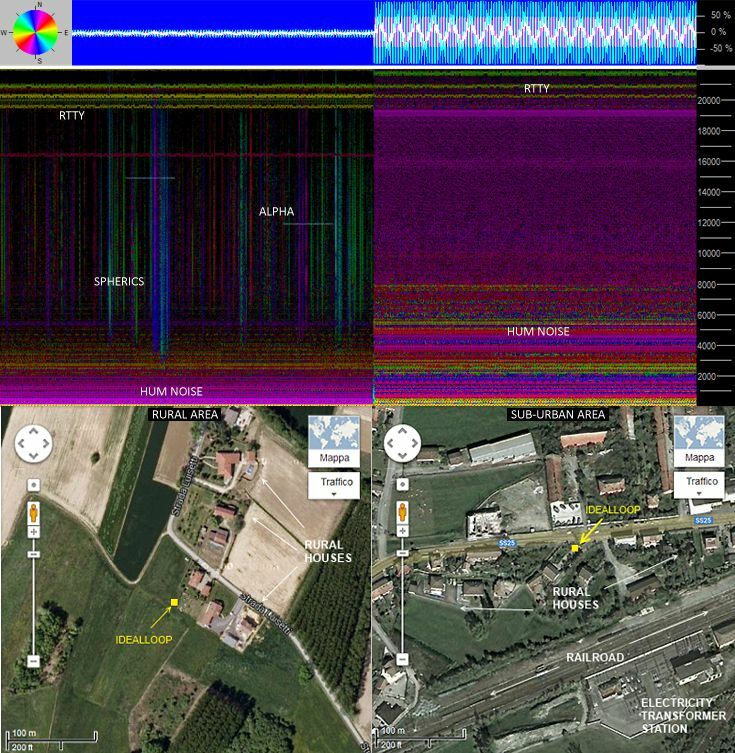 This device is able to receive, with a high degree of sensitivity, all the typical VLF radionature signals: whistlers, tweeks, chorus, hiss, statics etc. It is also able to detect the RTTY signals up to 50 kHz: for this reason it is suitable for SID monitoring. Here below panoramic reception in the VLF spectrum with "ordinary signal": RTTY, APHA, STATICS and hum noise, comparing two different receiving places. Reception taken 30 m away from home, in the middle of the country (IdealLoop is represented by the yellow square). This picture teach us that one thing is an "IdealLoop", while another is to have an "ideal place": any receiver is able to receive a clean signal in the wrong place, and even the places that at first sight look good may hide disturbances. In the low frequency the IdealLoop sensitivity is not enought to detect ZEVS signals, direct to submerged submarines, while Schumann resonances are weakly detectable, especially from the second one (14 Hz). This device is not able to receive geomagnetic pulsations: to receive these signals with a loop of 50 cm side they need at least 5 kg of copper wire, instead of 500g each loop used in this project. The presence of filters and the gain setting allows you to use this loop virtually anywhere without saturating. It however does not mean that it is able to receive signals of radionature everywhere. 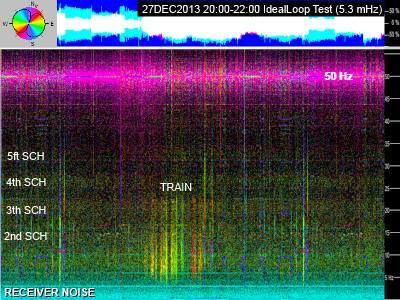 In the spectrogram above a rural area reception: Schumann resonances, 50 Hz main carrier, train passing 5 km far away (the yellow vertical traces) and on the bottom the background receiver noise. If placed on the balcony of a city apartment it will be able to receive signals from monitors, switching power supply, energy saving lamp and any other device that is operating close to it, but probably not the signs of radionature. It does not mean that it does not work but the place is not suitable. can be used with great satisfaction on every occasion. Almost like... an IDEALLOOP!